The Weybourne is available in various different dimensions, with this one measuring 3.0 x 3.0m. Further bespoke options and sizes can be considered for those seeking something larger or smaller. The roof is covered with grey slate composite tiles and has an overhang giving the double entrance doors both shade and shelter during the appropriate seasons. 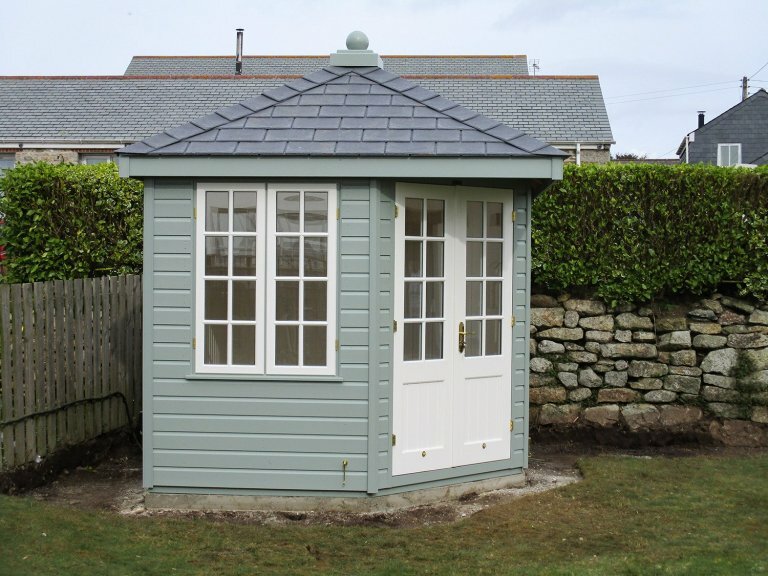 The summerhouse is clad with smooth shiplap and painted in a two-tone style using the colours Sage and Ivory that were selected by the customer from our range of exterior paints. Ivory is seen on the Georgian windows and doors, whilst the walls are painted in Sage. 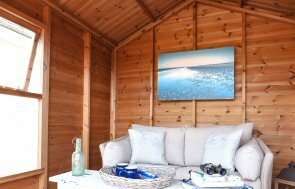 Internally, the building is fully lined and insulated which along with the double glazing ensures that the summerhouse is kept both warm and cool during the appropriate seasons. The customer has also chosen to add an electrical pack, which consists of internal lighting and four dual power sockets, as well as an external waterproof power socket and an optional heater. There is also painted pine lining in the shade of Ivory inside the building which has an airy and contemporary feel. We do also offer a Farrow & Ball interior colour palette for those wishing to choose from it. 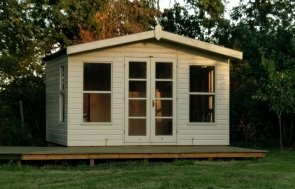 You can take a closer look at our complete range of buildings, including ones very similar to this one by visiting one of our UK showsites. Locate your nearest here, or plan your visit by getting in touch with us on 01760 444229.